A few months ago I wrote this ‘open letter’. The response was amazing and I’d like to see if I can make this event happen in September in San Francisco – so I wanted to repost this here and then I’ll follow on with more details shortly. If you’re interested in joining (or if you’re not in San Francisco, at least helping out) please a) sign up and b) send this on to friend, family and lovers in California. Thanks! After reading your post last week, I need your help to organize a Sleepathon – (anyone can sign up here). 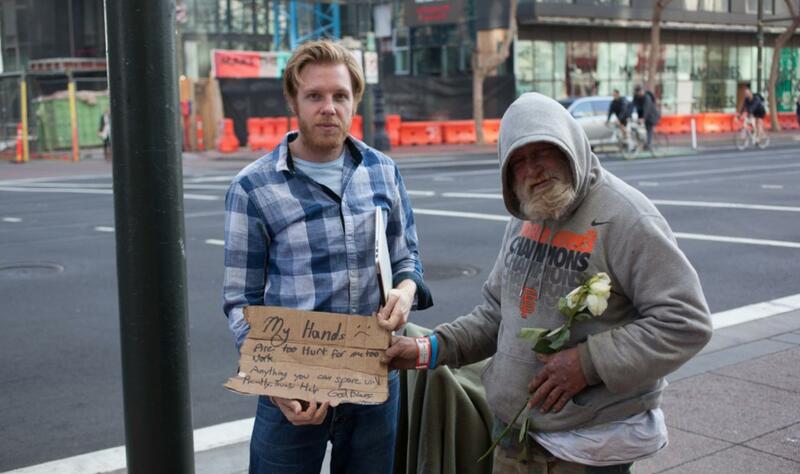 I am a homeless man, living in the Bay Area. But I’m also not that dissimilar from you – I am an entrepreneur with a new business, currently on 500 startups. Fortunately for me, my homelessness is a choice. When I read your post last week, it deeply upset me. So this weekend, I went down to Market St this weekend to talk to a few people on your behalf. 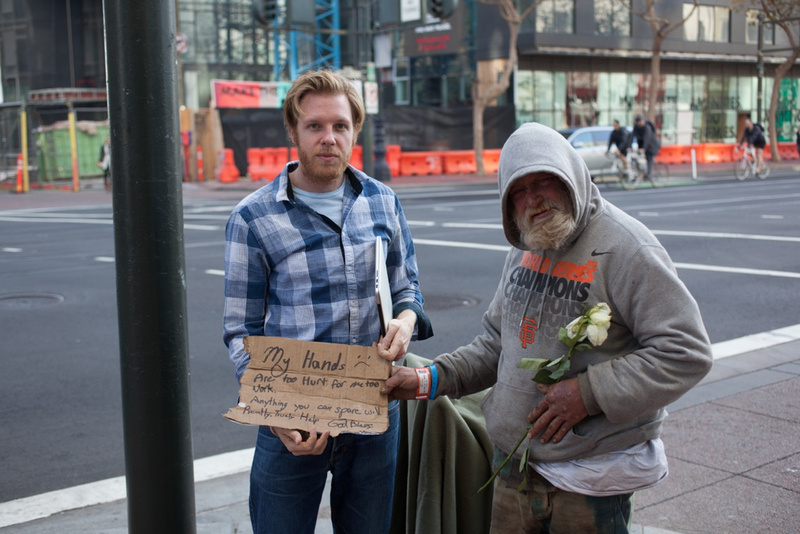 Sadly, this guy pictured can’t join one of your hackathons as his hands are in really bad condition, which is why he’s homeless as he can’t find work. He was also wearing a number of medical bracelets – he is a very sick man. Despite having very little, he offered a flower as a sign of peace as well as a hug. He was dirty, as you rightly noted many of the people in the area would be. But in my mind a hug outweighs the inconvenience of a bit of dirt. The people I spoke to seem to differ in opinion about the feeling that ‘it’s a privilege to be in that part of town’. They think the opposite, as this article indicates – they see it as a curse to be squeezed next to the rich. Greg, they see it as disturbing having you so close to them… At least you get a comfortable bed at night, whereas they often have no-one to turn to and nowhere to go. It’s way worse for them because it’s far, far harder to look up at someone who has all the opportunities that life can offer from rock bottom, without opportunity or hope, than it is to look down and watch your step. Many of them are very sick, physically and mentally – you might want to read this article by Russell Brand who eloquently writes about the struggles with addiction here. Which leads me to my request for help. You organize hackathons – it’s time to do good by your position. You are clearly disturbed by the presence of so many homeless people. So, rather than chastise you for your remarks, I want to ask you to help them. 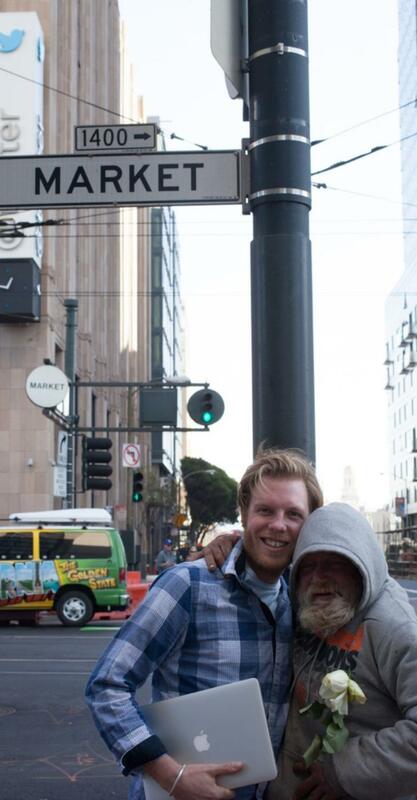 I too am disturbed by the number of homeless, desperate people in San Francisco. As an entrepreneur with the capacity and opportunity to help, I would like to do something about it. I propose we organize a Sleepathon, building on your success organizing such events. Imagine a night where we encourage as many people as possible, the extraordinarily privileged tech entrepreneurs especially, to sleep out for the night and raise money for the homeless. Could we get Mark Zuckerberg, Ev Williams, Kevin Rose and others to join us to sleep out for just one night? If we got a thousand people to join us and asked their friends and colleague to sponsor them, imagine what we could do. Perhaps we could find somewhere a little more comfortable than Market St for you, like Dolores Park? Have you noticed how cold it’s been the last few weeks? Some homeless people froze to death. These are people’s parents, children and siblings. Perhaps we can organize the event for the spring, when it’s a bit warmer too – giving us some time to get ready? Who knows, like my current ‘homeless’ situation, perhaps it could even be fun? Let’s use the unfortunate nature of your recent publicity to raise awareness, money and show support for these poor souls who haven’t been caught by the same protective layers of society that helped you and me. Are you with me? Sign up here to register interest. Next Post San Francisco Sleepathon… is coming!